Every business would love to have a movie star or pop idol rave about (and be photographed using) their product or service. These kind of endorsements have been known to make business skyrocket. But dealing with celebrities can be tricky. Celebs get millions of sample products in the mail from businesses hopeful of catching their eye, and they are notoriously hard to please. 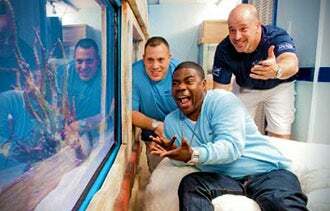 Recently, on the Animal Planet reality-TV show Tanked, the custom-aquarium builders of Los Vegas-based Acrylic Tank Manufacturing got an opportunity to build a massive shark tank in the basement of the New Jersey home of 30 Rock star Tracy Morgan. 1. Respond immediately. If you get a tip that a celebrity has a need for your type of business, hop on it right away. Here, the ATM team caught a break -- co-owner Brett Raymer was watching The View and happened to catch Morgan's request for a custom tank. Within minutes, ATM was on the phone and shortly after, on a plane to Morgan's New Jersey mansion. Most celebrity connections won't be quite this easy, but it can be worth scanning the celebrity magazines and websites for interviews to learn what stars are into and watch for a business opportunity. 2. Get creative. Stars tend to live large, so your usual offer probably won't do for them. In Morgan's case, he wanted a massive fish tank installed down the entire length one wall, along a narrow flight of stairs. Raymer and ATM CEO Wayde King thought fast, and concluded their normal construction methods wouldn't work. Instead of working primarily in their signature acrylic and creating the tank at their Las Vegas shop, they'd need to build the tank in fiberglass, ship it to Morgan's in sections, and assemble it inside the basement. 3. Collaborate. ATM didn't try to create this tank on their own. Morgan wanted an elaborate Jaws movie theme for the tank, so they turned to Aquarium Design Network to create a giant shark on the facade and a replica of shark-hunting ship The Orca from the film, all cleverly sculpted to hide the seams in the tank's construction. Other specialists in exotic fish and lighting were called in to complete the tank. 4. Shield them from bad news. When the ATM crew arrived at Morgan's home with the pieces of the tank, they made an ugly discovery. Despite their creative approach, the fiberglass tank pieces were still too wide to fit through the door and down the stairs. The solution? They waited until Morgan wasn't around and then carefully dismantled the door frame and pulled out the stair railings to get the parts downstairs. Everything was reassembled and Morgan was none the wiser. 5. Bond with them. Ideally, you don't want to just serve a celebrity and then move on -- you want to create a lasting connection that could enhance your brand for years to come. The ATM co-owners found their chance when they saw Morgan gliding around the grounds of his estate on a Segway. The ATM team expressed interest in the stand-up scooter and each asked to try it out. As a thank-you gift, Morgan later sent them a Segway of their own. Bonding achieved. 6. Get a testimonial. The most important part of a celebrity interaction, of course, is getting the endorsement. When you consider the cost of hiring a paid celebrity spokesman, this can be a big money-saver. If the celebrity posts or tweets about your product -- save it for your future marketing efforts. Since the Tanked team are also TV personalities, they got an on-air testimonial from Morgan. "You totally exceeded my expectations!" he raved. "You take it to 10!" If you can't get this lucky, follow up and request a signed head shot from the celeb and see if you can get them to write an endorsement on the photo. 7. Promote the endorsement. Celebrity endorsements are priceless for burnishing your brand. If you've got a celebrity customer, plan your next marketing campaign around that fact. Put up posters with their testimonial in your store. The great thing about celebrity connections is they have no expiration date. There are restaurants with pictures of stars from 40 years ago still on the walls, and that only gets cooler as the years pass. Has your business had celebrity customers? Tell us how you capitalized on the opportunity.